To help kick off the college admissions “Season,” I’m offering my new collection of inspiring college application essays–Heavenly Essays–for under a buck. Yup, you can download an ebook copy from this blog, and start reading right now, for just 99 cents. Now there’s no excuse not to check out examples of other students’ essays to help inspire you to get cranking on your own! I believe reading sample essays is one of the best ways to get ideas for your own topics. These essays are all examples of the narrative (storytelling) style, which I believe work the best for college app essays. It was the middle of the day, and I was relaxing on the big couch in the family room, happily watching the last few minutes of a potential buzzer beater game. First, my oldest sister walked in, followed by the other two with their friends. “Get out,” my youngest sister demanded, standing in front of the screen. I knew right then that all the begging I could do wouldn’t get her to budge, or the entire group to leave me alone. But I always gave it a try. “I’m not leaving,” I said, sinking deeper into the couch. After that, they launched into their threats and other attempts to push me out of their girl world. Ever since I can remember, my three older sisters did whatever they could to make me get lost. When they were all crammed in the bathroom playing with make-up in front of the big mirror, they would slam the door in my face. Or when they had friends sleep over, they would banish me from their bedrooms. It wasn’t that I wanted to join them in their activities, but I was bored and lonely. The only time they wanted me around was when they needed me to do their dirty work. Like when there was a spider to be caught, who did they call? Me. When there was trash to be picked up, who did they call? Me. When something went wrong, who did they blame? Me. But then things changed. By eighth grade, I started sprouting up, growing about a foot in just a couple years. Until 8th grade when all of a sudden everyone started looking at me differently. I had grown taller than everyone and now I was in control. I noticed that along with my new height, my maturity increased and the level of respect that I received from my sisters did as well. The teasing stopped. And we even started to have normal conversations about school and friends. Even my parents started treating me more like a young man than the baby of the family. Even though I can’t say I enjoyed some of those moments, I can say on some level that I understood that treatment since I was just at the bottom of the pecking order. And I also don’t feel like I need to get back at them, even though I now have the clear advantage physically. If nothing else, I am more sensitive to people who are at a disadvantage in the world, whether it’s because of social status or other circumstances. I know what it’s like to be the underdog. Even though my role in a family dominated by girls changed over the years, I was not completely off the hook. Having to complete the tasks that the younger brother would do never really ended. I still take out the trash, and stomp on spiders. But now when it comes to the last minutes of a Laker’s game, I’m not moving. ANALYSIS: Boy did Jack have a hard time settling on a topic. I know Lynn Fair of Square One counseling spent time brainstorming, and they kept hitting walls. Both of us kept urging him to explore his family because he had the three older sisters. But he was pretty resistant at first. But once he started describing out loud some of the details of his daily life as the youngest of a family of girls, I believe he began to hear his own story, and voice. This was a perfect topic for the fifth Common App prompt that asks to share a transition into the adult world. And I love his confessions: “I was at the bottom of the pecking order.” And, “I know what it’s like to be the underdog.” And his sense of humor: “I was the runt of the family.” By using self-deprecating descriptions of his childhood role, Jack can then show that he is now mature enough to look back and understand what was going on, accept it for what it was, and enjoy his new role without resentment. This reveals a mature, well-adjusted kid with a nice sense of humor. What else could you want? 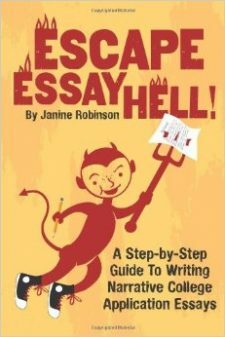 If you want to learn how to write a narrative-style, college application essay like this, just keep reading through this blog (Help By Topic) and/or check out my snazzy guide, Escape Essay Hell.